MIAMI, FL, November 13, 2018 – Miami-based United American Corp (“UnitedCorp”) (OTC: UAMA) is pleased to announce deployment of the final 1,000 miners in its first BlockhainDomes Heat Campus for a total of 5,000 miners online totaling of 8.5 megawatts of power and production of 25 million BTUs of heat and 60 million cubic feet of hot air displacement per hour in the four BlockchainDomes. The Company’s first BlockchainDome Heat Campus is now effectively operating at capacity. UnitedCorp is currently planning a second BlockchainDome Heat Campus which is expected to commence construction in early 2019. UnitedCorp’s technology uses the heat from mining servers to support greenhouse agricultural operations through the BlockchainDome Heat Station system which keeps greenhouses at 20 to 25+ degrees Celsius year-round. The cost of generating this heat from a single source is shared between multiple use cases and this represents a simple and more sustainable design solution compared to other mining alternatives. Commercial greenhouses in cooler climates like in the Province of Quebec typically require a significant amount of thermal energy to supplement daytime solar energy, particularly during the period of September to May, and many older greenhouses utilize inefficient heating systems for this purpose. In addition to heating, the dry heat produced by the BlockchainDome Heat Station is used year-round in positive pressure greenhouses to reduce greenhouse mold and fungus caused by condensation thereby reducing or eliminating the need for chemicals to treat this problem. This creates conditions for a more organic growth environment. UnitedCorp believes this “Heat Campus” approach for heat generation and utilization is the future for agriculture and any other industry that can make use of low-cost heat, with the ultimate goal being to get as close to zero waste as possible. This is not only good economically but allows businesses to “green” their operations by significantly reducing the amount of electricity the combined operations require from the grid. The UnitedCorp BlockchainDome was designed to provide heat for agricultural operations using ASIC (application-specific integrated circuit chip) mining operations where efficiency and low-cost operations are a priority. The BlockchainDomes, which utilize a proprietary passive cooling ground-coupled heat-exchanger technology, are particularly suited for situations where rapid cluster deployment is required as they can be erected and commissioned in a matter of weeks rather than up to a year using the traditional “Bricks and Mortar” approach. 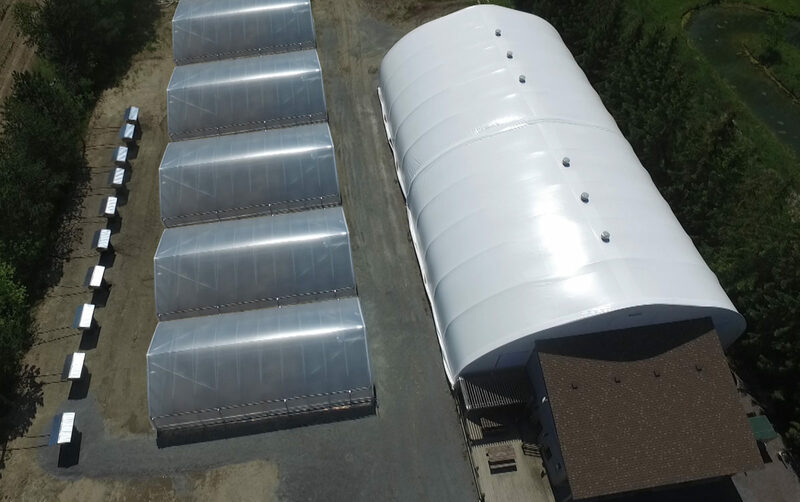 BlockchainDomes can be configured in a wide range of sizes to service any type of greenhouse operation.